The background to what became known as the Iran-Contra affair of the mid 1980s lay in US President Ronald Reagan’s pre-occupation with the spread of communism internationally, in particular in the United States’ own backyard of Central America. In 1979 the Sandinista liberation movement in Nicaragua had finally overthrown the brutal dictatorship of General Somoza and Reagan became increasingly convinced that the presence of an actively left-wing regime would spark revolution throughout the region and threaten the security of the USA itself. In the early 1980s his administration ploughed massive amounts of military aid into a number of governments in Central America that were beset by civil war and guerrilla fighting. In the case of Nicaragua, the focus was on destabilizing the government and engineering the overthrow of the Sandinista regime. Military aid was channeled to right-wing militia groups – the so-called ‘contras’ – fighting to achieve this. The American public, however, grew increasingly opposed to such funding and when Congress passed a law banning it, the White House resorted to covert means to continue its support. The scandal broke in November 1986 when the Reagan administration was forced to admit that it had been continuing secretly to fund the Nicaraguan ‘contras’ by means of arms sales to Iran which were themselves illegal and in breach of a trade embargo against that country. In testimony to the subsequent congressional hearings on the affair Lieutenant-Colonel Oliver North, who had been in charge of the covert operation, declared that Reagan and his Vice President, George Bush, had been aware of it, though both denied any knowledge of the details and no evidence was ever brought linking them to any wrongdoing. The affair nevertheless raised serious questions about the power of the executive and the extent and effectiveness of Congress’s oversight of foreign affairs. Death toll: The ‘Contra’ war against the Sandinista government caused tens of thousands of civilian deaths in Nicaragua. 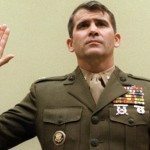 You should know: An immunity agreement with the Senate regarding his testimony in the affair meant that Oliver North’s criminal conviction was subsequently quashed. He is now a radio talk show host and columnist. Daniel Ortega, leader of the Sandinistas and Reagan’s chief bogeyman, is currently the democratically elected President of Nicaragua. 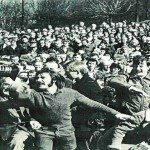 The so-called ‘winter of discontent’ of 1978-1979 which brought down Jim Callaghan’s Labour government marked a low point in Britain’s postwar industrial relations. When Callaghan took over as prime minister from Harold Wilson in 1976 he inherited an unenviable catalogue of national woes. Chief among these was Britain’s poor economic health. The country was already struggling to adapt to the new realities of international trade and accept the terminal decline of its traditional manufacturing base, so it was ill-equipped to withstand the huge inflationary pressures generated by the OPEC countries’ dramatic hike in oil prices after 1973. In the same year that Callaghan took office, the Labour government, in order to stem a potentially catastrophic fall in the value of the pound, had to go cap in hand to the International Monetary Fund for a £4 billion loan. There were of course conditions to the loan, the chief one being that Britain must make savage cuts in public expenditure. The Callaghan government managed to reduce its public spending by £1 billion, but such draconian measures were achieved at the cost of a massive increase in unemployment (1.6 million in 1978) and, most significantly, of the alienation of its traditional allies in the trades union movement. As 1978 drew to a close, the public service unions, whose members bore the brunt of the cuts, rejected the government’s attempts to impose a cap on wage rises and organized a series of strikes and walk-outs, causing serious disruption around the country. While the tales of uncollected refuse, understaffed hospitals and even unburied bodies at cemeteries were fuelled by media exaggerations, the ‘winter of discontent’ nevertheless demonstrated to the electorate that the government was no longer up to the job, and the resulting general election in May 1979 saw a decisive victory for Margaret Thatcher’s Conservatives. Toll: The Labour Party lost the confidence of the working classes. You should know: A popular and widely respected parliamentarian, Jim Callaghan was nevertheless criticized for a certain complacency in his handling of the winter of discontent. ‘Crisis? What crisis?’, trumpeted a famous headline in The Sun newspaper at the time. 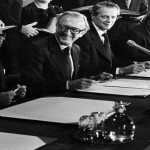 The 1960s was a decade in which Britain was busy divesting itself of its colonies in Africa. In most cases this process was smooth and free from conflict; Southern Rhodesia, however, proved an exception and by 1968 it was the sole remaining British colony on the continent. In discussions some years earlier about the transition to independence, the country’s white settlers – a minority group which exercised political and economic control – refused to countenance any move to majority rule, fearing that Rhodesia’s black population would be incapable of effective self-government. In 1965 the white Rhodesian government of Ian Smith defied Britain and declared UDI (Unilateral Declaration of Independence). Britain did not of course accept this and won UN backing for a program of economic sanctions which lasted for the next 15 years. External pressures were exacerbated internally by a debilitating civil war against the guerrilla forces of Robert Mugabe and his black Patriotic Front. As the 1970s wore on, popular support for the Patriotic Front grew until Smith was forced in 1979 to agree to multi-racial parliamentary elections. When these proved inconclusive Britain, in one of the first major acts of Margaret Thatcher’s new Conservative government, persuaded the principal parties to participate in talks held at Lancaster House, London. Under the chairmanship of the Foreign Secretary, Lord Carrington, the Constitutional Conference met for three months in autumn 1979. The resulting Agreement, signed on December 21, gave Rhodesia (soon to be renamed Zimbabwe) a new constitution and guaranteed a peaceful transition to full independence. Although hailed as a success at the time, the Lancaster House Agreement’s failure to resolve underlying problems, such as the key issue of land ownership, has left a country which today is in a state of near-total collapse with tensions between blacks and whites as high as ever. Death toll: The Agreement brought an end to the extended guerrilla war in Rhodesia which caused thousands of military and civilian deaths. You should know: The Agreement gave white Rhodesians certain ‘protective rights’, including a guaranteed 20 per cent of the seats in parliament. This quota was abolished by Mugabe in 1987. In 1967, when MP for North Devon Jeremy Thorpe became leader, the Liberal Party was long past its heyday. But he galvanized the Party back into action to place it firmly at center stage of British politics. At just 37 years old with saturnine good looks, rapier wit and a foppish taste in clothing, Thorpe radiated an extraordinary charisma that won the hearts of the electorate. There was only one problem – despite the fact that he was married, he was rumored to have had a passionate affair with male model Norman Scott back in 1961 when homosexuality was still a criminal offence. The whispers were so persistent that eventually, in 1971, the Liberal Party was forced to hold a ‘whitewashing’ inquiry to squash the story. At the general election of 1974 Thorpe was at the top of his game. The Liberals won 14 seats, holding the balance of power in a hung parliament. This was Thorpe’s moment… until the homosexuality smears resurfaced, to devastating effect. A man named Andrew Newton had been charged with the attempted murder of Norman Scott and, as a trial witness, Scott ensured that Thorpe’s name was dragged through the mud. The embarrassment was too much and Thorpe was forced to quit as Liberal leader in May 1976. Scott continued stirring and the story refused to die. In August 1978 Thorpe was charged with conspiracy to murder. With incredible bravado he stood in the general election of May 1979. But the allegation was too much for North Devon to swallow – he lost his seat, and a few days later appeared in court. The jury ultimately found Thorpe not guilty but the damage had been done – he had provided the nation with a sensational political scandal, his reputation was in tatters and the Liberal Party was permanently tainted. Toll: Politics was the poorer – parliament and the nation lost a major talent. 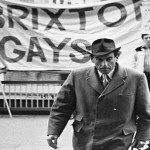 Jeremy Thorpe’s career was in ruins and tragically he was diagnosed with Parkinson’s disease shortly after, it was a terrible waste of a brilliant politician, and the Liberal Party was a spent force thereafter, ultimately merging with the Social Democratic Party to form the Lib-Dems. You should know: Norman Scott sold love letters written by Thorpe, one of which contained the line ‘bunnies can and will go to France’ – ‘bunny’ supposedly being Thorpe’s pet name for his lover. At Thorpe’s trial the judge summed up Scott as’… a fraud; he is a sponger; he is a whiner; he is a parasite’. The events which led to the resignation, on August 9 1974, of President Richard Nixon began in a relatively low-key way with the red-handed arrest in the early hours of a June 1972 night of five burglars. The building they were apprehended in, however, was no ordinary one but the headquarters of the Democratic Party in Washington DC, housed at the time in the Watergate apartment complex. As it emerged in the subsequent trials and investigations, the burglars had been part of a covert operation, known as the ‘plumbers unit’, which had already engineered one break-in of the Watergate offices to install bugging equipment. In the background was Republican President Nixon’s campaign to secure a second elected term and the eerily well-named CREEP, the Committee to Re-elect the President. In the November poll Nixon gained a landslide victory, winning over 60 per cent of the popular vote. But any sense of triumph was short-lived as the Watergate clouds darkened and Washington Post reporters Carl Bernstein and Bob Woodward kept the public supplied with fresh revelations of murky dealings in the administration. Although Nixon initially denied any prior knowledge of the break-in or involvement in a subsequent cover-up, the string of trials and resignations that followed ensured no let-up for the White House. In June 1973 John Dean, the former presidential counsel, formally implicated President Nixon in testimony to a Senate committee; the killer blow came, however, with the revelation that tape recordings existed of White House conversations covering this period. When the president refused to testify or to hand over the tapes, Congress began an impeachment process against him. As a vote for impeachment drew ever closer, Nixon bowed to the inevitable and, three days after finally releasing the tapes, announced his resignation in a televised address to the nation. Toll: Three of Nixon’s co-conspirators were jailed. Watergate cast doubt on the probity of politicians in general and severely dented the reputation of the legal profession because so many of those involved were lawyers. The affair made such an impression on the public consciousness all over the world that since then almost any public scandal is suffixed with ‘-gate’. You should know: One month after Nixon’s resignation, the new president, Gerald Ford, who had been Nixon’s vice president, granted him a ‘full free and absolute’ pardon for ‘all offenses against the United states’. Richard Nixon is the only US president to have resigned from office. If there’s one thing Americans like nearly as much as a good conspiracy theory, it’s a juicy political leak. One of the best poured out in 1971 when The New York Times started publishing excerpts from the so-called Pentagon Papers. This top-secret 7,000-page review of US conduct in Vietnam after World War II was dryly entitled United States-Vietnam Relations, 1945-1967: A Study Prepared by the Department of Defense. Completed in 1968, it was political dynamite. In 1971 one of the joint authors, disillusioned military analyst Daniel Ellsberg, enlisted the help of Anthony Russo and they copied the Pentagon Papers – before handing most of them to The New York Times. As soon as serialization began, political controversy and street demonstrations erupted, closely followed by the inevitable lawsuits. What was the fuss about? Quite a lot – for the Pentagon Papers revealed that four US Presidents, from Harry Truman to L B Johnson, had persistently lied about their intentions and conduct in Vietnam. Notable revelations included the fact that the war had been deliberately escalated with the carpet-bombing of Laos and Cambodia and that various raids and offensives had taken place without being publicized. The damning cumulative message to the American people was that their government had distrusted and misled them. President Richard Nixon accused Ellsberg and Russo of treason and obtained an injunction that plugged the leak in The New York Times… though not for long. On June 18 The Washington Post waded in and was immediately silenced by injunction. On June 29, Alaska’s Senator Mike Gravel entered over 4,000 pages of the Pentagon Papers onto the Congressional Record, ensuring that nobody could be prosecuted for publishing or discussing no-longer-secret contents. The message was underlined the following day when the US Supreme Court vacated gagging injunctions in a pro-free-speech First Amendment judgement. Toll: The publication of the Pentagon Papers weakened President Nixon’s ability to wage the Vietnam War, as the revelations of official misconduct at the highest level further hardened already disenchanted public opinion against the conflict. Humiliating military defeat duly followed in 1975 when the last US helicopter fled Saigon on April 30. You should know: Ellsberg and Russo were tried on treason and theft charges in 1973, fully expecting to be sent to prison for life. However, Judge William Byrne declared a mistrial after the government tried to influence him with an offer of the FBI directorship and evidence emerged of massive illegal activity against the accused pair, including unauthorized wiretapping and a failed break-in at the office of Ellsberg’s psychiatrist by white House ‘plumbers’ Liddy and Hunt who hoped to discredit Ellsberg by making him appear mentally unstable, it was their unsuccessful rehearsal for the subsequent Watergate affair.